Fall is a time of renewal for me, and also a time when I feel the most creative. So, I want to test out a new idea which is Trendy Thursday. A blog every Thursday dedicated to either a color or fashion trend, sometimes both. Please feel free to read this and let me know if you enjoy the post and this idea. Also, I need suggestions on what color or trend to do next. Okay, I have been feeling this purple trend lately. The violet and lavender thing started in the spring and summer, and now that fall is rolling in I have seen more of the berry and vampy purples popping up in places and in new makeup lines. I love it! Purple used to be a color that intimidated me, but now that I have tried it out I like it. What I love about purple in general is that it is so flattering on all skin tones. 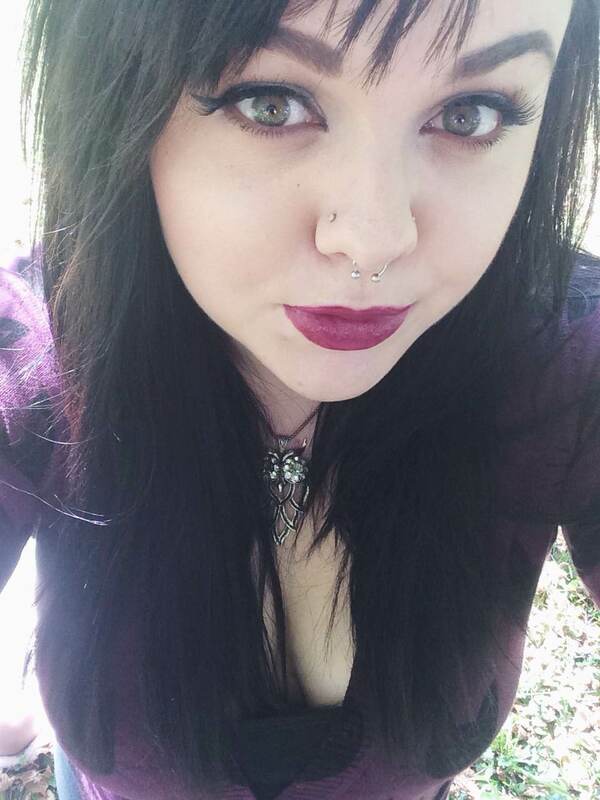 I feel that everyone can pull purple clothing and lipstick off no problem. On my lips is LA Girl’s glazed lip paint in “Seduce.” I love this color. I feel that it is the perfect berry shade for early fall. 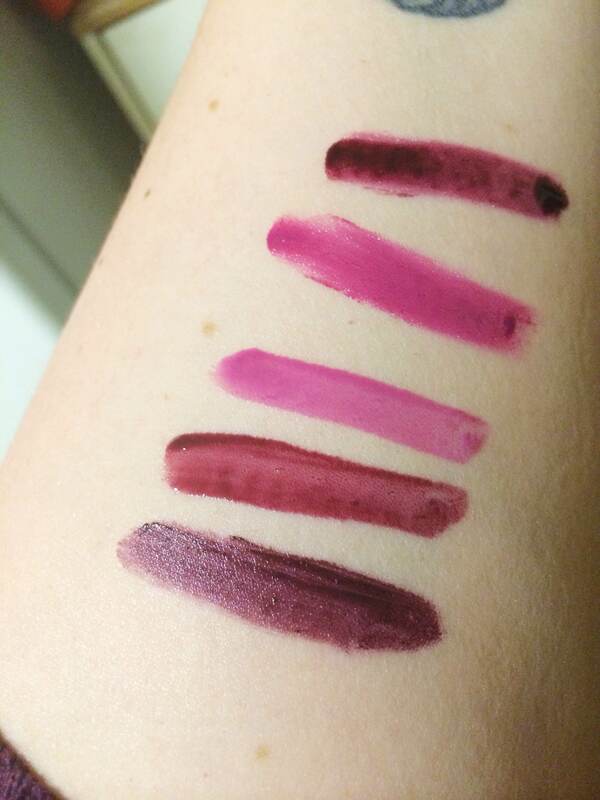 I have mentioned these lip paints in a prior post, and I still love them! The application can be a bit messy for the darker colors, but my Eco Tools lip brush helps me out with that. I paired this lipstick off with a matte neutral eye using my Too Faced Natural Eyes palette (review to come) and Red Cherry lashes in #605. Because I wanted more focus on my lips, I lightly contoured my cheeks with Nyx blush in Taupe and lightly dusted Nyx’s blush in Dusty Rose on my cheeks. My purple cat cardigan is actually from Target, and it is from their fall 2014 line! I love this cardigan. I got it on sale for $14 a few weeks ago and it is form fitting and so so comfortable. I also wanted to include in the post a few more swatches, including a swatch on the skin of the color I am wearing on my lips. 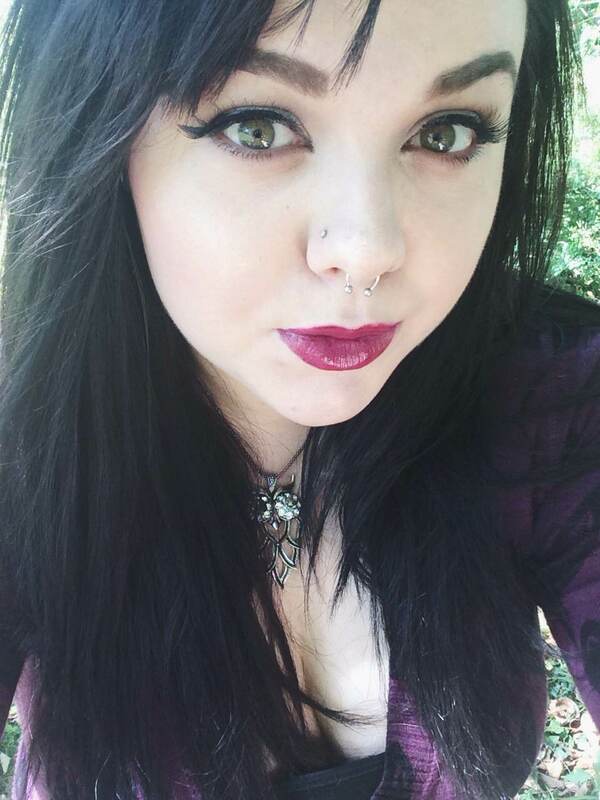 Nyx soft matte lip cream in Transylvania- I absolutely adore this shade. It is a deep vampy matte purple, and it is so affordable. These lip creams also smell like vanilla cupcakes, so that’s a plus! I will say that the formula is a bit drying, so I typically put lip balm on beforehand and use a lip primer. Nyx Devil’s Food Cake- I know, this is not really purple. It is a bit of a berry shade, and I wanted to include it because it will darken up lighter purple lipsticks if you’re wanting a glossy berry finish. I had bought so many of the butter glosses from Nyx before they sold out to Loreal. 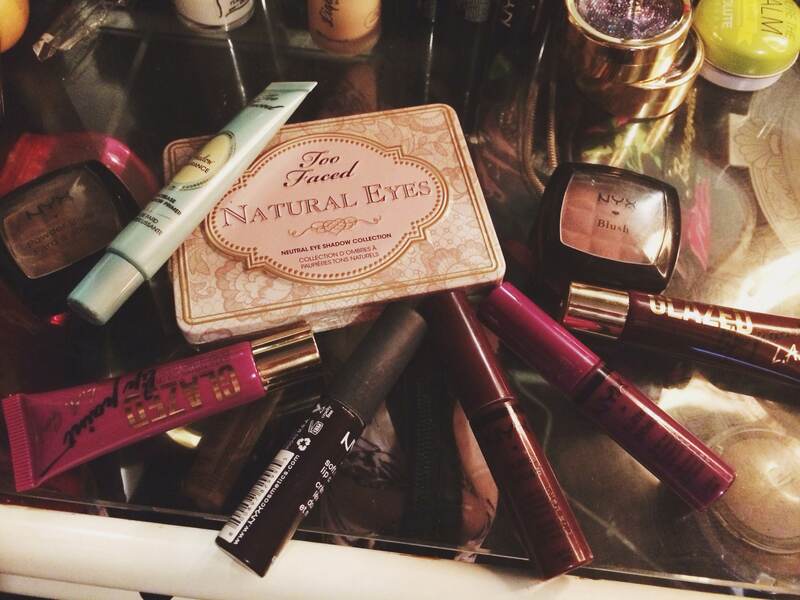 I really love them, and I am sad that I will not be repurchasing them after I use them all up. So, if you’re wondering why I am including Nyx in my posts again, that’s why. I’m currently trying to use up all of my lip products by them. Nyx butter gloss in Raspberry Tart- if you’re wanting a kind of sheer purple to just test the waters, try this shade. Butter glosses go on very smooth in general, and though they are not long lasting, they do not feel sticky on the lips at all. They also have a very pleasant scent to them. LA Girl’s glazed lip paint in Seduce- this was the color I am wearing in my photos this post. I love this color. The application is flawless as well as the color. I now have 8 of these lip paints and I plan on getting a few more. They are only about $4 each and now come in 18 different colors! Obsessed. LA Girl’s glazed lip paint in Tempt- This is another berry color, but it’s super deep. I love this color. Due to the formula of the lip paints though, the application of this color can be messy and patchy. I’m not a huge fan of the applicators themselves of this product, so I typically put a little product on the back of my hand and apply it with a lip brush. 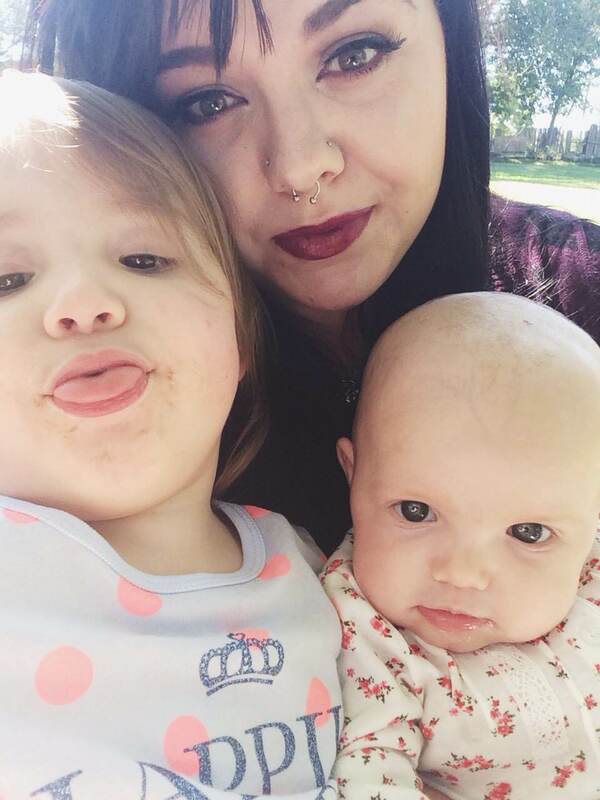 Just to add a bit of myself and my everyday life into the post, here’s a picture of me and both my daughters, Piper (3 months) and Harmony (2 years). This picture captures them both pretty well. Harmony is the light hearted goofy one and Piper seems to be the more serious child, though she’s still a very happy baby. We played outside for a bit today and enjoyed the nice weather. I can’t wait until the local corn mazes start to open up. What are some of your favorite family fall activities? all of these opinions are my own, and this is not a sponsored post. If any of the above posts interest you, please subscribe to my blog! I am really hoping to have enough followers soon to have a giveaway on my instagram! Thank you for stopping by!